Iquitos. Well, that place was weird. And why wouldn’t it be? 400,000+ people living in a city not connected to the outside world by roads? Recipe for strange. Our sixth and final boat brought us to one of the many crowded ports in Iquitos. There were countless boats of all shapes, sizes, and qualities. These people gotta eat, right? Our group of seven exited the boat, a little unsure of the next step, and took mototaxis toward the downtown area in search of a hostel. We stopped, consulted Christina’s Lonely Planet, waited, asked around, waited some more. I think it was about an hour before we were greeted by a hostel owner who advertised S 15 each with space for 7. Sold. We were graciously allowed to check in at 8 am and were thrilled to shower, nap, and eat some non boat food (which was questionable at best). Our first night, we enjoyed good food and beer while entertaining the idea of jungle tours. There is no shortage of tour companies in Iquitos. In fact, we learned pretty quickly that Iquitos is quite the tourist city. Many people from all over the world come here just to see the Peruvian Amazon and leave. Iquitos is also the home of ayhuasca. Everyone is talking about it. *Pro tip – don’t book your jungle tour in advance online. You’ll end up paying 2-3 times more. *Try to research your ayhuasca retreat and shaman as much as possible beforehand. Many people are just trying to make a buck. Our first night we met Mike (ya, that’s not his real name), a tour operator and owner. We ended up nicknaming him “free drinks” because that seedy character was all he really meant to us. Mike talked for far too long about his tour company, over free drinks, and the group managed to break off and went to bed early. Great place for free drinks! The next few days passed similarly. Many people arranged jungle tours and eventually Claudia and I were left just the two of us. We continued to run into Mike and his jungle tour was offered cheaper and cheaper. We had time, so why not? We booked a 4 day, 3 night jungle tour that was really… I want to say beautiful but I’ll add, again, strange. The website for this company offers 3 day, 2 night tours for $270 (all inclusive) per person. I’ll just say, we paid significantly less than this. The first day, we took a van about 2 hours to Nauta. From there, we took a boat another 2 hours into the Payaca-Simiria Reserva. This company, like many others, had a jungle lodge where we unloaded our bags and provisions for the next few days. Our current group consisted of 3 Canadian guys (Kan, Hanspal, and Chester), the 2 of us, Kale, an Australian girl, and Everton, a Brazilian on his first jungle tour as a volunteer with Mike’s company. After a late lunch, we went to a small village. 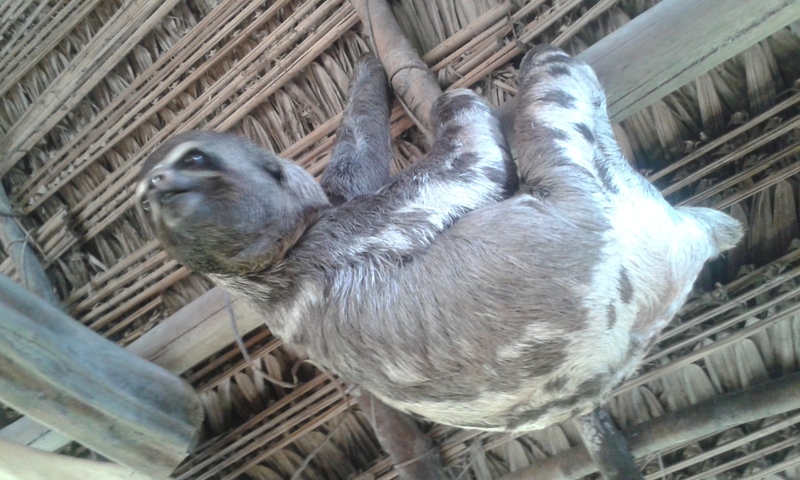 One of the families there housed two pet sloths. After sloth sitting, we went to see the Amazon dolphins. At the lodge, we had another big meal and the witching hour dawned. Mosquitos. Pretty fierce in the Amazon. And in mass quantity. The couple hours after dusk were trying every night. The next morning, we woke up early and took a boat down the river to do some bird watching. For me, the birds were my favorite part of the jungle. Not only were they beautiful in every shape and color, they were the orchestra of the jungle. Non-stop music. After birdwatching and breakfast, we went for a group jungle hike. Our guide pointed out many medicinal plants. We viewed trees whose barks’ were used for stomach aches, head aches, mosquito repellent, etc. We returned for another huge meal, a quick nap, and then we geared up for another hike. This time we walked through jungle swamps. We saw giant, gorgeous trees with exposed root systems. We were in deep mud and were warned against grabbing the trees for stability. Words of wisdom from my friend Loki… Don’t trust the trees sometimes they’re quite pokey. The hike ended at a lagoon. Giant lily pads with elegant purple lotus flowers floated gracefully across the surface. Wow. After dinner, we retreated to the mosquito nets surrounding our beds to escape the witching hour. The next morning, we said goodbye to the Canadian gents and welcomed Matt, USA, and three ladies from The Netherlands. We began, again, with another boat ride for bird watching and also visited Monkey Island. After a big breakfast, we took another hike through the jungle. During this walk, we saw a large black and yellow snake slithering through the jungle. Our guide, with the help of Kale, caught the six foot snake and brought him back to the lodge to show off. We had lunch and watched rain fall while the sun still beamed brightly. After the rain, we took the boat to view the playful dolphins again. The sun was out, and we were gifted a sparkling rainbow across the river complete with pink dolphins jumping up to say hello. We had our last dinner and went to sleep to the sound of the rain. 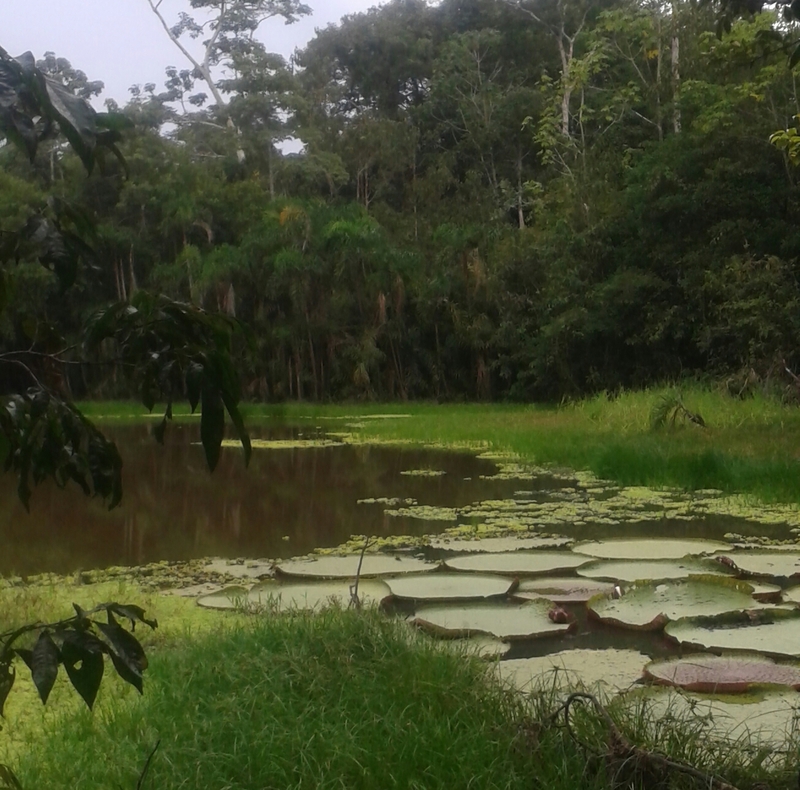 The next morning, we did a final jungle walk before packing up the boat and heading back towards Iquitos. At about 7 pm, we had made it back and checked into our hostel. Claudia and I spent three lazy days after in Iquitos. Saturday morning, we woke up early, took a bus to the airport, and boarded our first flight together. Airplanes, how novel. Overall, we had a good time in Iquitos and the Amazon, but the energy there is a clear reflection of the rainforest and its inhabitants. I recommend going and definitely take the boats in, out, or both! We’re off. On a plane! What a concept! Hey Bekah! Is there any possibility if you could tell me which tour company you used for your Pacaya Samiria trip? Thanks in advance! No problem, link below! I recommend waiting until you’re there to book, it will be significantly cheaper. Have fun and if you’re brave enough, take the boats in or out for a really unique cultural experience!! Enjoy your trip! !